Yesterday I attended one of my classmate mother's funeral. She was 83 years old of the Indian origin. I took her almost like a mum because she saw me grew together with her eldest son who has retired a couple of years back. Her death was due to complication of long sickness in diabetic and six months ago she had to amputate her left leg in order to survive this dreadful disease. Though she had six children, many grand children and a few great grand children, non had the time to care for the sickly lady before her death. Except the last daughter who is still single, prepared not to get marry but to accompany the mother. However the last six months were the most difficult period for the mother and daughter. The old lady was extremely weak and one of her leg was amputated. While the caring girl had to work and to report for duty everyday. She cried to see her mum's condition. Silently she prayed and seek for God's holy assistance. During this period of time, the next house or the neighbour was doing some minor renovation. A foreign Indian worker was on the job working independently alone. He knew what was happening at the next home. One day while the daughter was coming out of the house, this Indian man approached her and offered to assist the pitiful mother. With some encouragement and recommendation from their neighbours, my friend took the courage to employ this stranger to help the mum in every way he could. In their house my friend proudly introduced this simple man to me. He is a God sent son who assisted my mother to her last breath of her life. 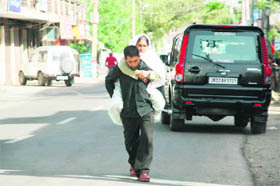 He carried mum like her own mother. He cleaned and washed mum from top to bottom. He fed her with food and water. He stayed with her in the same room without complaint. When mum vomited suddenly, he wasn't afraid to clasp both his hands and to hold back her throw out. He related stories and cheered mum all the time. He never demanded anything except a place to sleep and some food to eat. This simple man is only 29 and I could see he has a lot of love in his both eyes. I have to say it again, non of her children or her in laws could have the heart of this stranger. I couldn't bear to hear this unbelievable story from the sorrowful daughter. I cried while listening. In order to control my emotion, I stood up to hug this man who could not understand my language. As humble he was, he offered a smile to acknowledge my feeling too. Before I left the house later, I took out some remaining notes in my wallet and forcefully gave them to this man I so admired. Yes! Though we don't speak the same language but he spoke "The language of kindness. The blind can see and the deaf can hear." It's powerful enough to make me cried.